I have written quite a lot on Microsoft Word, and I have frequently noted that since the introduction of the new file format in Microsoft Word 2007, the software is rather buggy when you use it to write long, technical documents. It works perfectly most of the time, but it is still the most buggy Microsoft product I have ever used. And it can become a nightmare if you write very long documents and do not take proper caution. 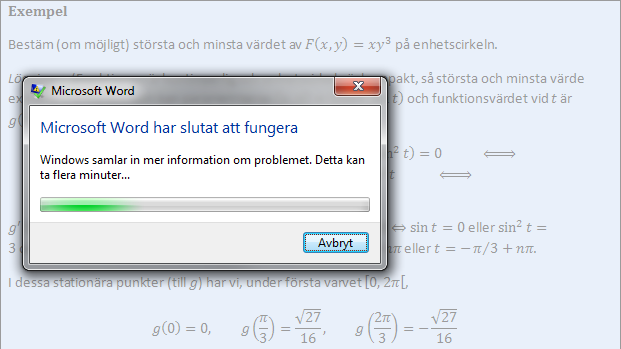 In particular, Microsoft Word tends to crash when you edit formulae, even fairly simple ones. It does happen every now and then. 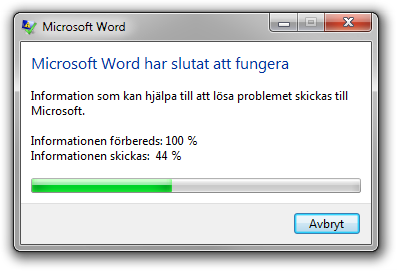 On the bright side, in most cases, Microsoft Word will automatically restart after a crash, and will display the document as it was immediately before the incident (even if you didn’t happen to press Ctrl+S just prior to the crash). This almost compensates for the instability. You can even take advantage of this ‘feature’ by doing some physical exercise while the software is restarting and the Windows Error Reporting tool is collecting and sending data about the crash to Microsoft (which is a good thing, because this might make Microsoft fix the bugs). However, sometimes this doesn’t work very well. On several occasions, the following has happened to me. When Microsoft Word has restarted, the document looks exactly as it should, i.e., it looks just as it did prior to the crash. Content about this, I finish the document, and export it to a PDF file using Microsoft’s built-in PDF converter. Then, when I look at the PDF document, it looks as it should, except that nonsense data is inserted at a seemingly random location. This data is sometimes text I have entered sometime, somewhere, or it might be something else. Then I go back to the DOCX file, but it looks perfectly sound: there is no sign of the nonsense data. A spinal cord reflex1 makes me turn on the display of hidden characters (Ctrl+(), and there it is. I remove the nonsense, save the document, and create a new PDF file. 1 No, not literally. This almost certainly passes through the cerebral cortex.